Here is a killer idea from Martha Stewart for using old t-shirts that you are no longer wearing! It also gives you a great "bag" that you can use for shopping or toting random kids' crap stuff from hither to yon. I think some of my daughter's t-shirts would make the cutest purses. 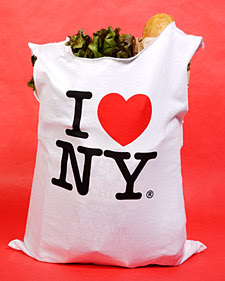 And, using light-weight t-shirts for this would give me the perfect reusable bags for produce. Come on, you know you want to show everyone that "Team Building 1999" shirt! You can find the super simple instructions on How To Do This here. If you can sew a straight line, you can do this! awesome! i'm so doing that! i tried to make my daughter a dress out of my I luv NY shirt (that I bought on the street and never fit me) but I made a mistake and cut it too small! This looks like an even more practical project for old shirts! Gotta love Martha! I am willing myself to remember this idea so that when my daughter grows out of some of her favorite shirts, and even soft t-shirt dresses, we can turn them into pool bags or purses for her. My mommy brain may not allow me to retain this information, though! -Jamie - sewing a straight line is much easier than it seems. I dare you to try it!